Korea's favorite beast idols are releasing their first photobook! 2PM held their first concert tour in July and August 2010 in Seoul and Busan. Fan response was so enthusiastic, the group added two more sold-out Seoul encore shows in September. They also performed in Thailand in November for the Mnet Ultimate Live Concert. 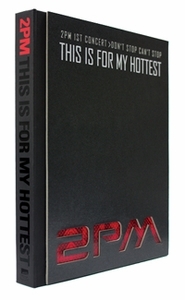 Released for all the Hottest out there, 2PM's 200-page 1st Concert Making Story Photobook features many behind-the-scenes and live photos from their concert tour, as well as pictures from MULA 2010 in Thailand and a questionnaire section (in both Korean and English) where the 2PM members spill their thoughts. The photobook set also includes a 16-minute concert making-of DVD.